When you're looking for that great, once-in-a-lifetime Morgan that everyone will enjoy - at home, on the trail or in the show ring - stop by the farm for a visit. 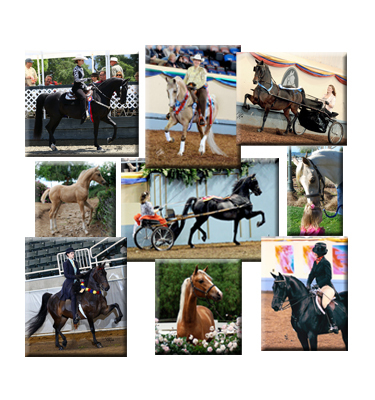 We specialize in talented,, beautiful, smart, fun horses exceptionally suited for all ages - especially the mature (and young at heart) rider and for all the dressage disciplines; cowboy, classic, traditional and western! So when you're looking for a great quality, uncomplicated Morgan that everyone can enjoy - at home, on the trail, in the show ring or on the dressage court - stop by and see us. Western, hunt, classic, pleasure, park or just a new family friend, you will find a rainbow of colors here on the farm. Less than 60 minutes from both the beautiful San Francisco Bay and Monterey Bay areas we are located in San Martin, right down the road from the "garlic capital of the world" - Gilroy, California. The door is always open and you're welcome to come in, pull up a chair and enjoy a warm visit in the shade of the cool pepper trees.